The Shabbat, a day of rest for the Jewish faith, was in honor of Avi Schaeffer, a young man who focused on upholding his religious values while striving to connect people of different faiths. Schaeffer, a student at Brown University, died on Feb. 12, 2010 when he was hit by a drunk driver. 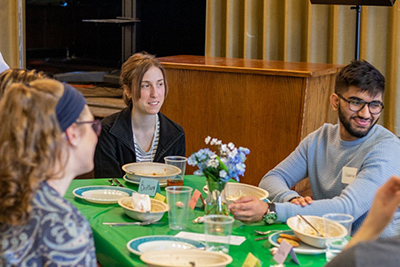 Hillel upholds his legacy by dedicating the Avi Shabbat Interfaith dinner every year to his life and the peace he spread. President of Hillel and West Bloomfield senior Max Miller started off the event alongside West Bloomfield senior Maxwell Smolin with a prayer and the lighting of two candles to honor Shabbat and create ‘shalom bayit’, or domestic peace. Miller said his focus was to create opportunities to talk about how to practice traditional religious values in a modern world. The opening prayer was followed by Mariam Saad, a graduate student who was born in Lebanon and is a member of the Muslim Student Association. She said a prayer for those affected by the terrorist attack in Christchurch, New Zealand on March 15, which killed 50 people and injured dozens more. She gave solace to the group through a reading from the Quran. Riley Anderson, senior and music director at Wesley Church, said a prayer that focused on his gratitude for the togetherness at the event. “Let this be a time where we learn from one another, and to gain a different perspective from those who have different beliefs from ours,” Anderson said. The Shabbat focused on celebrating the unity of different religions while also discussing the obstacles students face when practicing.